The 1,100 seat W.R. Watt Arena is fully climate controlled with a dirt floor for competition surrounded by 1,100 stadium seats. There is plenty of crating area on the upper concourse level, and underneath the seats on the floor level. The site features a concession stand and restrooms. 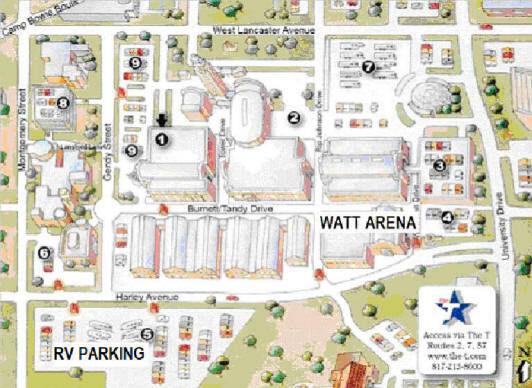 There is a per-day parking fee at Watt Arena. This is a facility-imposed fee, not a club fee. Payment can be made with cash and major credit cards. The parking attendants will issue a parking ticket for display in the vehicle and collect payment as vehicles enter. In and Out Privileges: The parking attendants at the site can give you a dash card to allow you in-and-out and multi-day pass. JUST ASK FOR IT when you pay your parking fee. There is not an extra fee for in-and-out privileges. 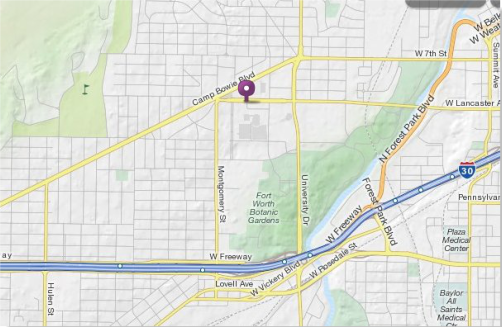 RV hook-ups are available on a first-come, first served basis on several lots. Contact Will Rogers Memorial Complex, Amon Carter Square, Fort Worth TX 76107, 817.871.8150, for information & payment. DO NOT leave valuables (especially dogs) in your vehicles. Standard Parking, the parking operator, will have staff at entry points as well as staff walking the facility during normal business hours.